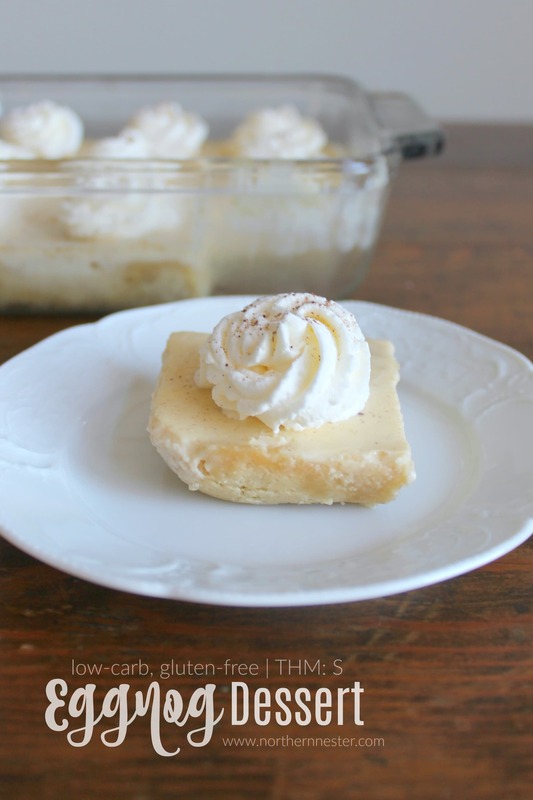 If you love eggnog, you will love this low-carb, Trim Healthy Mama S Eggnog Dessert made with all the wonderful flavors of my favorite Holiday beverage! 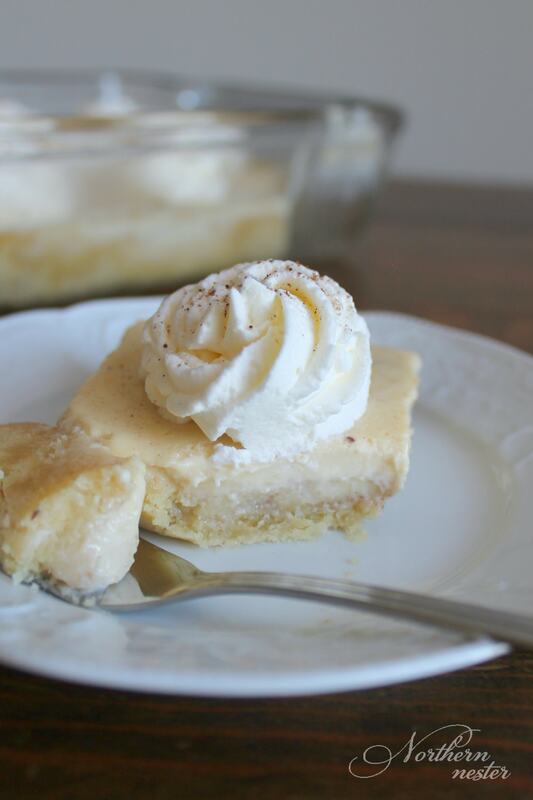 This Eggnog Dessert can be made as squares or into a pie, whatever you fancy. You’ll need either an 8×8″ baking dish or an 8″ pie plate. Any brand of gelatin will set the filling. The purest varieties are Great Lakes and Just Gelatin, but Knox will work, too. The whipped cream and nutmeg garnish is optional, but it really helps to pretty up this bland-looking, yet incredibly decadent dessert! If you love eggnog, you will love this low-carb, Trim Healthy Mama S Eggnog Dessert made with all the wonderful flavors of my favorite Holiday beverage! Preheat oven to 350 F. Melt butter in saucepan with xylitol until sweetener is dissolved. Remove from heat and stir in almond flour or pecan meal. Press into an 8x8" baking dish (or use a pie plate, if you prefer a pie instead of squares). Bake for 10-12 minutes, or until golden. To make the filling, add whipping cream, sweetener, and nutmeg to a saucepan and bring to a simmer. Cook for 6-8 minutes. Meanwhile, pour cold water over gelatin in a small bowl and let it soften for a minute. Whisk 1/4 of the warm cream mixture with egg yolks. Return egg yolk mixture to saucepan, whisking constantly. Whisk in softened gelatin and rum extract. Cook for 3-5 more minutes. Remove from heat. Stir in butter until melted. Cool to room temperature. Pour filling over crust. Refrigerate for at least 4 hours, or overnight. Optional: garnish with whipped cream and nutmeg before serving. Hubby & I LOVE eggnog! I’ll definitely be making this! Awesome! My hubby doesn’t like eggnog, so I got this whole dessert to myself!! Mine is in the frig now and has already set up in like a half hour! I was worried cuz CRAZY me ended up whisking the cream mixture into 3 of the egg whites INSTEAD of the egg yolks. (I’m so used to whisking egg whites I guess?) I did add the yolks too. 🙂 And, I had to taste just a bit off the spoon before washing the spoon and OH MY!!!!! WE LOVE EGGNOG! Can’t wait to have it tonight! Thanks Jacinda! Would coconut flour be a decent substitute for the almond flour? I’m new at THM baking. Is the rum extract necessary? I don’t have any on hand and I want to make this! 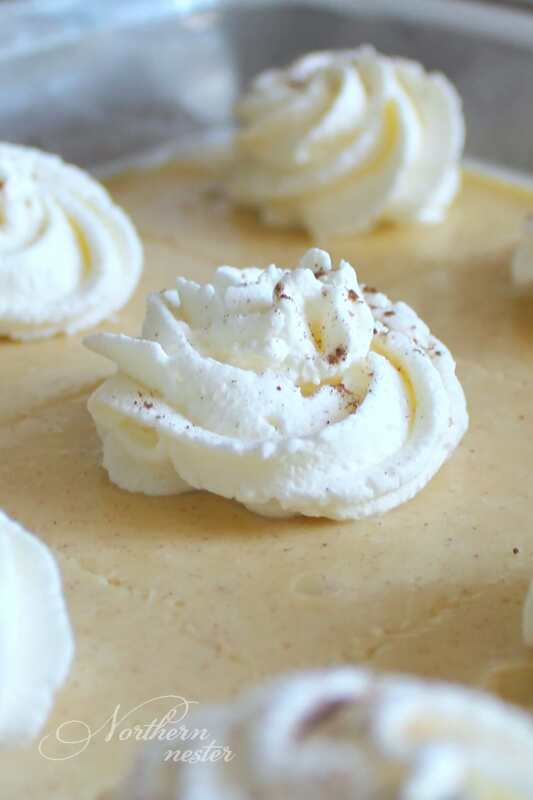 The combination of rum extract and nutmeg is what give this dessert is distinctively eggnog-ish taste. You could make is without, but it probably would taste very eggnog-y. Looks so good! !I have heavy wbip cream and unsweet coconut milk carton,can i use any alternative to half n half? You can use whipping cream instead, it’ll just have a higher fat content. I would love to make this for Thanksgiving. I currently only have powdered Swerve. Do you know what the conversion for that would be?